It is most gratifying to see the seeds of the ‘ALL’ consciousness sprouting into fruition far and wide. Ripples of change are expanding, momentum of connections is accelerating, energy of care and concern is multiplying, and motivation to learn and strengthen ourselves is on the rise. The exponential reach and instant connect of the ALL networks can be attributed to the source of it ALL –the ALL-inclusive and ALL-embracing consciousness that is resonating deeply with the innate wisdom of everyone’s heart. So the ALL ethos is not creating any new concept or culture – it is simply reconnecting us to our most natural state of being that delights in harmony and creativity. With over 500+ chapters across the world and more emerging, women are coming together with ALL their heart to collaborate in diverse ways in safe and supportive spaces for interaction. These are enabling personal well-being, professional growth, and public leadership. We can ALL feel our rising confidence, multiplying connections, and boundless possibilities of collaboration beyond borders. The uplifting energy and integrating ecosystem are there for ALL of us to plug into. When we add to it our own positive energy and leverage the many opportunities, we can surely lead the change in our homes, countries and societies, ushering in the much needed understanding among cultures and peace across borders, apart from becoming self-assured in our own personal expressions and excelling in ALL that we do. ALL is a most unique global network and international women’s chamber to have free membership for ALL women, with the only requirement being for each one to bring in abundant positive energy and a will to do, and this we do through a system of referrals. I earnestly urge you ALL to continue recommending new members who bring in more positive energy and creative force. Our greater task remains to include millions of women out there in every part of the world who are still disengaged from empowering networks and can immensely benefit from them. I also welcome you to start in a new chapter in your city or sector. We need millions of leaders to transform the space for billions of women. In fact, those are the very thoughts and feelings behind our mega marquee annual global summit, the Women Economic Forum. WEF is the blessed catalytic space, our solar plexus so to say, to energize ourselves at multiple levels through exponentially enhancing our thought leadership and global connections we can ALL take the quantum next leaps required to take ALL forward year after year. Women’s role in this task of transformation is to be “Soul-diers” – fearlessly lighting the lamps of love again and again and again, and ensuring that they are never blown out by the tremors of terror, fear, hate and intolerance. It is time for the Goddess within each woman to emerge and walk amongst us a Soul-dier: one who is a Harbinger of Change; one who is proactively Uplifting the World; and one who with her drive and dedication is Transforming Lives with her radiant example. At our Annual/Regional WEF event around the world, you will experience a powerful, positive and purposeful energy of multidimensional thought leadership and global friendship in the midst of great networking for business, discussions over hundreds of diverse themes and topics, inspiration of new start-ups, friendships growing across credos and faiths, within the vibrant context of great economic opportunities that India as the fastest growing economy in the world has to offer. Also our movement of women engages with men as well who support our cause. Indeed, ALL is a shared vision led by women to bring more inclusion, inspiration and innovation to not just women but to ALL. I invite ALL to experience this new awakening and lead this togetherness in motion. With ALL of you, this dream is destined to be. ALL and WEF started with humble sparks of sisterhood and have today emerged as a powerful mega movement for sisterhood and our collective empowerment and enabling. Our Vision is to bring Wealth, Wellbeing and Welfare to ALL of Humanity, irrespective of caste, creed, gender, generation, religion or political affinity. 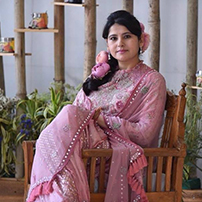 Our Mission is to connect as many women in trust and togetherness so that we can encourage entrepreneurial action and collaborations by women for ALL, which will bring us economic independence and leadership prowess. Our Path is that of sisterhood and brotherhood so that our vision of Gender Equality and Empowerment is without Gender Divisiveness. Our Code of Conduct is of ALL Positivity and No negativity, with an ethos of helpfulness and remaining non-political, non-religious and non-dogmatic. Today, we are a robust global network of 800 chapters and having outreach to 100,000 inspiring women. We have also launched Mission Million as our Milestone 2020 by when we hope to be connected to a Million sisters; a humble step toward connecting a Billion. 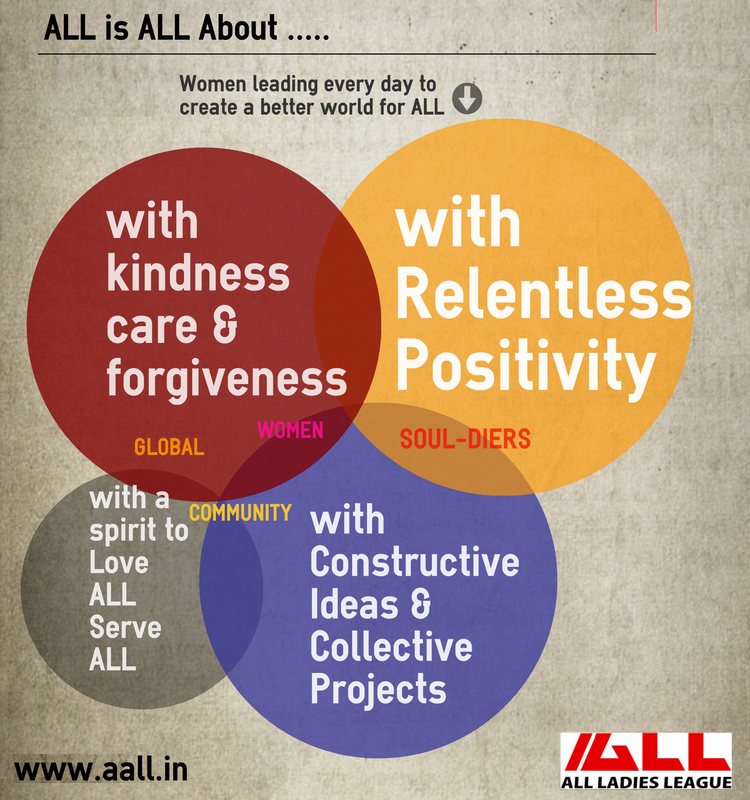 ALL Ladies League (ALL) is the world’s largest All-inclusive international women’s chamber and a global movement for the Welfare, Wealth, and Wellbeing of ALL by empowering women’s leadership. The acronym ALL stands for our inclusive spirit and faith in the power of one and all. With an empowering culture of positive energy and helpfulness, and a firm rule of non-divisive and non-discriminatory discourse, ALL is committed to building bridges, celebrating diversity and energising business and creative collaborations beyond borders, boundaries, and bias. ALL is non-political, non-religious and non- dogmatic. ALL believes in unleashing the power of each One through the power of Oneness. As an ‘Internet’ of women, ALL is an all-inclusive worldwide web of women’s leadership, friendship and entrepreneurship in ALL spheres, sectors and strata. ALL is the only such international chamber in the world to offer completely Free Membership to ALL women and supportive men who bring in positivity and inspiration. Membership is only given by invitation and reference. Our All-inclusive way of working is a decentralized distributed leadership model wherein every chapter, and its chairpersons and members are fully empowered to create and deliver on any agenda of interest. In this way, ALL ensures maximum leadership and minimum control; maximum networks and minimum hierarchies; maximum creativity and minimum platitudes. With connections to 100,000 members and inspiring women across 150 countries, ALL & WEF are among the largest women’s networks offering the widest outreach to women in the spirit of “sisters beyond borders.” With a focus on enhancing mentorship with sponsorship, we are fostering an ecosystem of sharing and inspiration, resulting in innovative and entrepreneurial collaborations across all levels, energised by a spirit of readiness and responsiveness to support one another. In our hundreds of chapters and groups worldwide that function as Lighthouses beckoning those who seek support and need networks. Here, women from diverse fields are coming together and expanding circles of sisterhood and empowering the chain of change; helping each other in real time and in safe spaces to expand networks and collaborate in personal and professional ways. There would be no “single” overarching group that would dominate the agenda or approach at ALL. On the contrary, to enable expression of the plurality of ALL energies and expressions in loving enterprise, we encourage a multiplicity of smaller spheres of interest to spontaneously coalesce and drive innovation in self-determined areas. At a functional level, the smaller groups drive innovation much more. 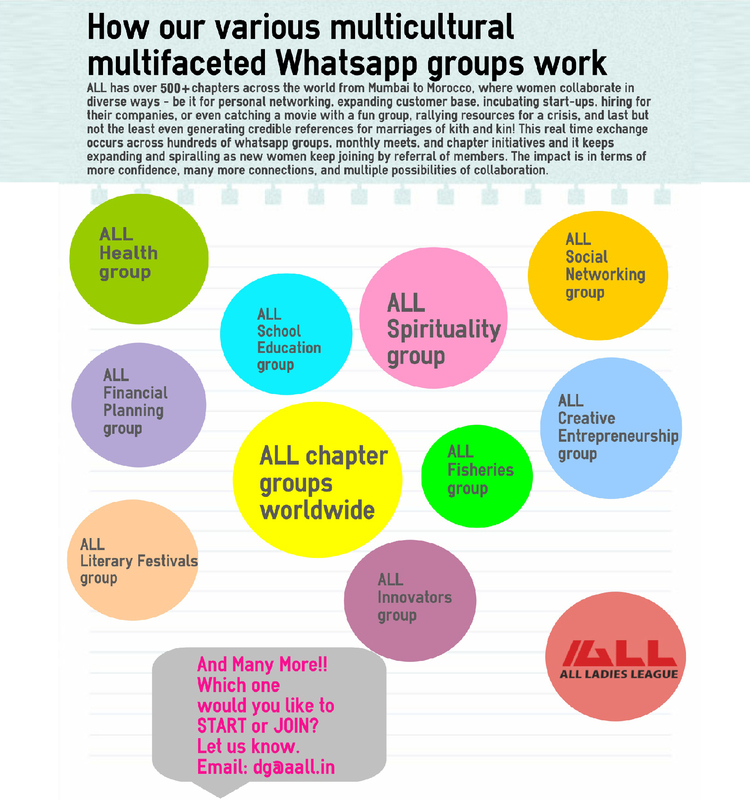 We offer much freedom and flexibility to our chapters situated in different contexts across the world to chart out their own approach within the open-hearted ethos of ALL. This relativity, creativity and vibrancy are integral to our approach. The only ‘glue’ to keep this ever- expanding and ever-evolving entity together is our spirited adherence to the shared human values of kindness, helpfulness and positive energy. This cohesive spirit and dynamism in diversity fosters understanding and innovation.